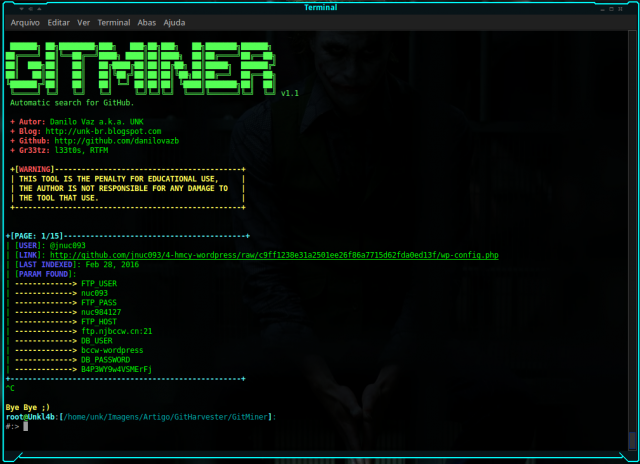 GitMiner is an Advanced search tool for automation in Github, it enables mining Github for useful or potentially dangerous information or for example specific vulnerable or useful WordPress files. This tool aims to facilitate mining the code or snippets on Github through the site’s search page. Mining Github relates to the act of scouring Github using the public search engine for sensitive or useful information in code, commit messages etc based on certain search patterns (which can include file types, target file structures like wp-config.php and languages used). It’s a good practice for an organisation to search its own Github repositories if any of them are public to ensure they aren’t leaking anything sensitive. Or read more about GitMiner for mining Github here.